Pen case found by Isao Kuniyoshi around the Shimamui monument. The name “Masao Uema” is inscribed on its lid. 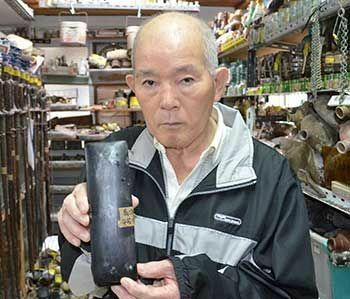 Seventy-nine year-old Isamu Kuniyoshi, who has collected remains from the victims of Battle of Okinawa for the past sixty years until he retired from collecting in March 2016, found a black pen case with the name “Masao Uema” inscribed. The pen case was found among the numerous stored items at his home in Naha city. Fifty-three year-old Yasuo Minamino from Naha city, who helped Kuniyoshi, noticed the pen case with a name while he was looking at the items at Kuniyoshi’s house on March 11. Kuniyoshi and Minamino, “want to get it back to the owner,” and are seeking information from those who may know the owner. Kuniyoshi has found bones from 3,800 bodies over the past sixty years, and has handed them over to the prefectural government. He also returned items to owners and their families when the owners of the items are identified. 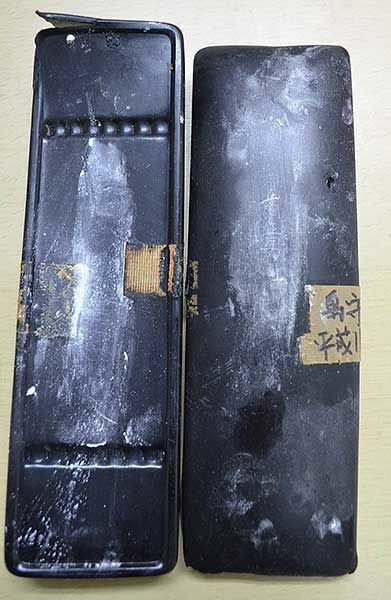 The pen case that was confirmed to have the owner’s name is 20 centimeters in length, 6.5 centimeters in width, and 2.2 centimeters in height. Kuniyoshi found the pen case when he was collecting remains around Shimamui Monument in Mabuni, Itoman City in 1999. Kuniyoshi says, “[Returning the items to owners and families] is my hope,” and calls for information. For questions and information, contact Minamino at 090-3840-9140.